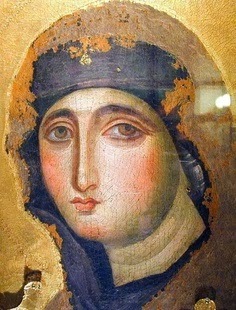 Advocata Nostra, the oldest icon of Mary in Rome, at the Dominican Sisters Convent on Via Trionfale on Monte Mario. This icon can be traced back to its origin in Jerusalem, where tradition has it that it was painted by St Luke after the Resurrection, at the request of the apostles. But the tradition also states that after St Luke had sketched the outline, the image of Our Lady appeared on it. No human hand was involved. Such works are referred to as achiropita—'made without hands'.